Robert Pepper’s 2016 Mitsubishi Pajero Sport Exceed review with pricing, specs, ride and handling, safety, verdict, rating and video. In a nutshell: The Pajero Sport is a very capable mid-sized 4WD wagon that lives up to Mitsubishi’s reputation for tough offroaders. The Pajero Sport offers good value, above-average safety and a decent tow rating. It is a superb offroad vehicle, particularly if ground clearance is improved, and would be a good tourer, once range is improved. But it can't do everything, and while Mitsubishi claim it to be a "family sport car" it doesn't have seven seats, the second row isn't particularly spacious and the child tethers are poorly located so wouldn't always be the first choice for families. Onroad handling isn't sporty, more adequate, although it does the dirt well. While it's modern and has all the usual features the vehicle is no luxury car. Regardless, the Pajero Sport is a fine vehicle that lives up to Mitsubishi's good reputation for creating tough, capable wagons at affordable prices, and like most Mitsubishis somehow seems to earn respect over time by being more than the sum of its parts. WE HAD AN EARLY DRIVE of some foreign-spec Pajero Sports in Japan ahead of the local launch, then another go at the local launch. Now we’ve had the car for a week during which we were able to conduct an offroad test, so we’re finally able to report in detail on Mitsubishi’s most important new vehicle for quite some time. Sadly, the Pajero as we know it will be discontinued, along with the Lancer and its revered performance car derivative, the Evolution. Mitsubishi’s direction is now all about eco-friendly SUVs, and the early direction there is the Outlander PHEV, one of the few plug-in hybrids available on the Australian market. The Pajero is still available but very much showing its sixteen-year age, as we discovered in our most recent review. This leaves the Pajero Sport to carry forwards the Mitsubishi reputation for offroad-capable wagons. The Sport is actually based on the newly developed Triton MQ, sharing the engine and some of the running gear. We’ll cover Pajero Sport vs Pajero in another article, but in brief; the Sport has only five seats, whereas Pajero has seven, and Sport has a beam axle at the back compared to Pajero’s fully-independent. The Pajero is heavier, more powerful, slightly larger and has a five-speed automatic compared to the Sport’s eight-speed unit. From the outside the Sport is distinctive and modern in the thin-headlight-with-DRLs fashion. The polarising feature is the rear tail lights which were the subject of many comments, and exactly of those was positive. Still, it is the way of these things that familiarity brings acceptance, and we only have to think of the early reaction to the Gen III Pajero when it was first launched. There is an exciting shade of red available for the Pajero Sport, but our tester was a much less interesting silver and it was a dusty day. Anyway, the Pajero Sport is far too serious a vehicle to be bothered about winning beauty contests. Mitsubishi say it is a “family sports car”, and offer it in three grades; GLS, GLX and our tester, the top-end Exceed. Starting at the front we have the usual; glovebox, sidepockets, sunnies holder and centre console. That’s about where it stops, as there’s no clever little features for extra storage or convenience. There’s no pocket under the dash for phones or miscellaneous bits of kit, no giant glovebox, the centre console storage isn’t split as it is on the Triton. That’s a bit disappointing given this car is a new design, as owners of 4WD wagons tend to have all sorts of small gear that needs to be close to hand. Fortuner, for example, has pull-out coffee holders and a dual glovebox. The front seats are fairly comfortable and the steering is reach/tilt adjustable. There is electric seat adjustment on the Exceed but not a lot of it. The two drinks holders behind the shifter don’t much get in the way. The second row is a bit spartan. A bench seat, 40/60 split, nothing special, not even air vents. It doesn’t slide backwards and forwards either. If and when Mitsubishi bring the seven-seat Sports over then this will count against the vehicle. The second-row seatbacks can at least be tilt-adjusted, and there are two positions for the cargo blind to accommodate different angles. Click any image in any of the galleries to view it full sized. Into the back and this is where three separate but related criticisms can be levelled at the car which mean it must be marked down as family-friendly. First, the child restraint points. There is only one fitted, not all three. You’ll need to go get the other two mounts yourself and screw them in. Also, all three are located in the roof, right at the back of the car. This is a terrible place for them as it’s hard to get to, and the straps then interfere with any cargo you have in the car. Second, the seatbelt for the second row middle is a similar story. Like many cars, but typically older designs, this one has the seatbelt attached to the roof. This again will interfere with cargo, and if you lay the seats down flat(ish) then you need to disconnect the seatbelt and store it in the roof. For many owners, this won’t matter, but for people with carseat-age young children who load the back up (offroad tourers, for example) these will be inconveniences if not dealbreakers. The third problem is the location of the spare wheel release…which will require some unloading to get to. These things should be located in the door jamb where there’s no chance of it being buried under cargo. All three issues are avoidable and really should not exist on a car as new as this one. Now onto the positives. There are four strong tie-down points, sensibly located. The light is roof-mounted and effective (although I’m a big fan of swapping them out for LED striplights), and the boot is fairly capacious and deep. The tailgate is one-piece lift-up and easy to operate. Our test car had about 7000km on the clock, and judging by the body and underbody that included a fair bit of offroading. Nevertheless, it drove nicely and everything inside seemed hard-wearing enough, as it should be for anything with Pajero in the name. Overall, the Pajero Sport has a functional interior but nothing to particularly commend it, and the design aft of the front seats could do with some attention. The general impression of quality and ambience is favourable, the car doesn’t feel cheap and nasty, but it’s a fair way off anything like luxury. Switchgear is Japanese standard so easy to use for most Australian owners. There’s no major problems with controls other than the modern inclination to do away with easy-to-use dials and switches in favour of touch controls, a sin which Mitsubishi are sadly not alone in commiting. The infotainment unit is the same Android Auto/Apple Carplay unit we had in the Pajero 2016 GLS test, and we reviewed it in detail here. The only point to add is that this time we used a Galaxy S7 which integrated much more smoothly than the previous S5. And even though you are going to click the link to the review, a quick recap – there is no satnav unless you connect your phone, and then you lose the ability to independently operate your phone. This can hardly be viewed as a positive. There is a fairly basic, by 2016 standards, centre dash display covering the usual fuel consumption and the like. It doesn’t do clever stuff like replicate navigation or sound system information. There’s two USB ports, but both are in the centre console. There you’ll also find a HDMI port for video – which we would never bother to use – and a 12v socket. There’s another 12v in the dash, and another in the boot…but none in the second row. Only the driver’s electric window is one-touch, and the rear windows don’t go down all the way into the door. On the Exceed Mitsubishi have fitted a DVD player in the roof. Apparently you insert these things small circular objects called “discs” into it, a rather quaint notion in today’s world of streaming video. As we said in the Kluger review, these players are now total a waste of time. You’re far better off simply using two 7″ tablets mounted to the back of the headrests. Mitsubishi would have been better off spending the budget on compartments and USB/12v outlets to the back instead. There is keyless entry on all Pajero Sports, but it’s Mitsubishi’s slightly odd system which requires you to press a black button to unlock, as opposed to merely grasp the doorhandle. Locking is also via the black button, or use the keyfob. So on the inside the summary is not bad, but nothing outstanding to lift it above its competition. As to the family-friendly; if all you want is a SUV to trundle around the bitumen and do a bit of dirt-road work then you should not bother with a 4WD wagon like the Pajero Sport, Fortuner or Everest. Instead, look at the myriad softroader options – Hyundai Santa Fe, Land Rover Discovery Sport, Toyota Kluger, Mitsubishi Outlander and so many more. These offer seven seats, are cheaper, have better designed interiors, and typically more safety gear. Only bother with the 4WD wagons if you really want to tow or go offroad. Around town: A mixed bag. Starting with the negatives; the steering is slow, requiring more wheel twirling than should be the case in a modern 4WD wagon. The ride is harsher than you’d expect in a wagon of this nature, but feels worse than it is because there’s a bit of suspension noise. Rear visibility is not great thanks to the tiny windows around the boot, but there’s a partial fix for that with the rear view camera and sensors. Onto the good points now – visibility is good to the front and sides, the turning circle is only 11.2 metres which is better than most of its competitors. On our Exceed model the 360 degree camera combined reversing sensors front and rear made carpark maneuvering very easy, so if you’re one of those people thinking this is too big a car, think again. It’s very easy to drive. The vehicle never feels slow either. Diesel auto 4WD wagons very often lack a bit of get-up-and-go, but this is minimised in the Sport which is responsive (for a diesel in its class) and has an intelligent, quick shifting auto that makes the most of its 133kW and 430Nm. The relatively light tare weight of around 2000kg helps too. At any suburban speed the auto is happy to cruise in the gear divided by 10, so 60km/h in sixth, and 70 in seventh. This contributes nicely to fuel efficiency which is probably best in class or close to it, and helps with a general feeling of comfortably relaxed torque-propelled driving. We found the same thing in our Hyundai i30 long-term test, and it’s the total opposite of the frantically revvy Suzuki Vitara we’re testing now. The Pajero Sport has Mitsubishi’s Super Select system offering 2WD, AWD, 4WD and low range modes. This is fully explained in detail here and our test demonstrated yet again why the 2WD (2H) mode is a total waste of time, even working against the car. Firstly, there is no fuel advantage we could measure, nor any handling improvement. But there is a significant disadvantage and that is traction. The Sport is quite capable of spinning a wheel on takeoff in the wet or on dirt, especially if you’re turning, for example going around a roundabout. When that happens the stability control kicks in, rather abruptly, slowing progress. The solution? Very simple, drive the car in 4H (all wheel drive mode) and then you’d have to drive like an actual hoon to get any wheelspin at all unless you’re actually on ice. Overall, this car is easier to drive than its competitors around the ‘burbs. Parked. Tight turning circle helps. On the open road: Not the Pajero Sport’s great strength – yet it doesn’t do anything badly, just not as good as some peers. The suspension is still harsh, but offers good control even with some body roll (almost an offroad motorsport tune), handling is as benign as you’d expect from a 4WD wagon, but the tyres squeal in protest earlier than expected. Traction in 4H (all wheel drive mode) is never a concern. Cruise is comfortable, with the eight-speed ‘box allowing relaxed cruising RPM, and as ever, it’s always in the right gear ahead of time, making the most of the engine which is quietly gruff but never intrusive. Mitsubishi may say it is a Pajero “Sport”, but that doesn’t extend to handling. If you really want a Mitsu sports car, we highly recommend snapping up an Evo while you can. Transmission controls. You flick it sideways to go into manual mode via the paddles or front/rear movement of the shifter to select gears. The dial is the Super Select transfer case selector. The button on the left is hill descent control, and the one on the right is Offroad Mode selection. Dirt roads: Mitsubishi are dirt-road specialists. I don’t think I’ve ever driven one which didn’t do dirt roads well, and that includes the Evo. So it was no surprise the find the Pajero Sport can be hustled along very nicely on brown roads when in 4H with the suspension soaking it all up, inspiring confidence, drivers have fun. Not sure about passengers though. Get out of shape and it’s all very predictable and easy to control. Again the auto knows what it’s doing, no real need for manual control unless you want to hang the car on the throttle. I liked the way the car’s ABS locked up enough for quick stops and allowed a bit of directional change under brakes and weight shift. Big tick. The only negative is a bit more gravel rash noise from the rear than was expected. Offroad: Mitsubishi have effectively married the best of trusted and true 4WD design with the latest technology to make the Pajero Sport an impressive offroader that is up there with the best wagons on the market. Now into the detail, starting with an overview of what offroad features the car offers. There’s recovery points front and rear, and decent underbody protection. The alternator is typically Mitsubishi-low, but the air intake seems well protected to give a 700mm wading depth, not bad but not top of the class. You’d get a snorkel, of course. Typical 4WD track; no choice in the line, so clearance is essential. Track Foresnics (TM) tells us the diff is dragging. Not by very much, but enough to stop the car. The ground is soft earth so there’s no risk of damage or loss of control, so we back up and give it another go with more speed. That works. The aftermath. You can see where the diff has rubbed clean, as has the mass balancer. Other standard vehicles cleared it with no problem, so yes, small differences matter. The Pajero, as a comparison, has fully independent suspension with a stock clearance of 235mm, and does well in situations that require ground clearance. Also on the clearance front it was disappointing to see the same mass balancer found in the Triton in front of the Sport’s rear differential. As you can see from the photos above, it does drag on the ground. 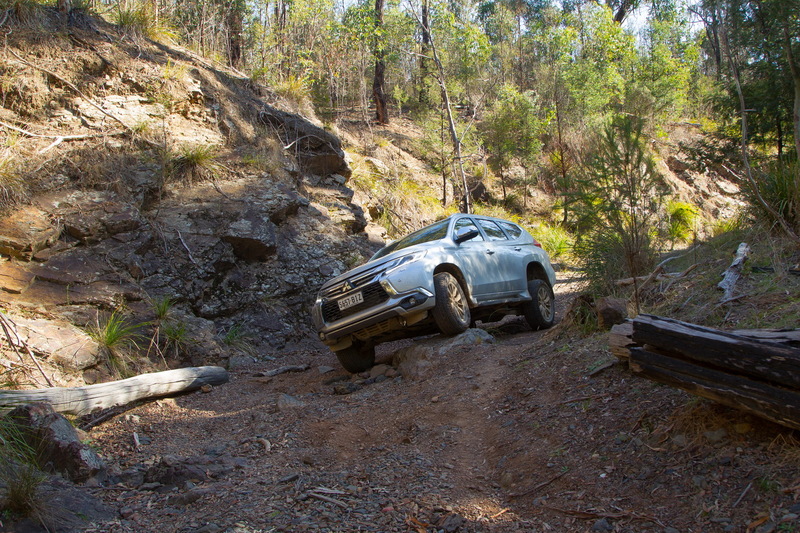 Mitsubishi say, correctly, that it is higher than the rear diff but the fact of the matter is that it shouldn’t be there, and will get in the way – as it did in our Triton test on the very first obstacle, particularly as it is square-cut. We also found it filled with mud then stubbornly resisted the attentions of a high-pressure hose…and who’d like to get under their car with a screwdriver to poke mud out of it? Not me. In practice though this balancer isn’t a massive issue for most situations as the Sport is still very capable, but we hope to see it disappear in the next refresh. It’s also a signal that development dollars weren’t enough to design it out. Rock mode. The skid icon bottom right refers to stability control being deactivated, not traction control. The AEB is also disabled as per the icon top centre. These modes adjust the traction control, stability control (the two are not the same, read more here), gearshift settings and throttle response to set the vehicle up to best effect for different terrains. Notably, the Mud/Snow mode is for deep, loose surfaces as distinct from say Land Rover’s Grass/Gravel/Snow which is for hard, slippery surfaces. The official documentation refers to a “limited slip differential effect”, but to be clear, that’s replicating the effect of an LSD through electronic traction control, the vehicle does not have a mechanical LSD. There are paddle shifts to change gears manually, or you can use the gearshift. Mitsubishi are one of the few manufacturers that have their paddle shifters fixed to the steering column as opposed to turn with the wheel. This is a good design, certainly offroad, as it means the shifters are always in the same place. Ferrari think the same way too, and so did Nissan until the latest revision of the GT-R. Offroaders may well be shifting gear with a full steering wheel turn applied, so Mitsubishi have definitely got it right. So the only weakness of note is ground clearance but that can be fixed with taller tyres – not a suspension lift as per Pajero, as the Sport runts a live rea axle. On the positive side – the traction control system is first class, quick to engage, smooth and effective – a bit of a contrast to the rougher Everest that was one of our safety cars on this test (you can see the difference in the video above). Mitsubishi had a notorious problem with traction control on Pajeros – it would often overheat and deactivate on long, shaley hill climbs. This led some to say all traction control had the same issue, which was incorrect then and even less correct now. This overheating issue seems to be less of a problem on newer Pajeros, and while we didn’t have a chance to properly test to see if the issue affects Pajero Sport, we’d assume it would not as this traction control system is quite clearly a different revision to the previous models. Even if it was a problem, the rear locker can be used for those long shaley climbs. The Sport’s turning circle is tight, and at just over 2000kg the vehicle is lightweight for its size and class which has benefits everywhere; quicker response, less sliding, less sinking in, less fuel used and so on. The eight-speeed auto offers at least one gear for any given situation, knows which to use when, and the engine has plenty of usable torque instantly available with no turbo lag. You can also choose second gear to pull away in either high or low range, unlike some other 4WDs. The centre diff can be fully locked, which offers good safety and control on hills; old school, but good school and so far no new tech has managed to improve on the good old lockable centre diff, and most attempts make it worse (most recently on the HAVAL H9). The car was in and out of various ranges and always shifted first time, although 2H to 4H requires coming off the accelerator. Reliable shifting in and out of ranges is something you can’t take for granted these days. Hill descents are easy in the Sport. The eight-speed ‘box has a crawl ratio of 42:1 which is very good for an automatic, unlike the days of old when Mitsubishi’s rather average low range meant engine braking was something of a joke. There’s also an effective hill descent control system; it just keeps the same speed it’s set at. The electric parkbrake is effective, and happily, there is a manual release system should it get stuck on. There is a rear locking differential (GLX and Exceed, not GLX) but using it disengages traction control on the front axle. Memo to all 4WD manufacturers – this is wrong, stop being lazy and have traction control work on the front axle when the rear locker is engaged. If Ford managed it with the PX2 Ranger then you can too. End of memo. Oh, and PS: having a rear locker in for descents is good too, helps with the engine braking. Anyway, such is the effectives of the traction control it means that for almost all situations you’re better off having traction control work on all four wheels rather than just the rear two doing all the work due to the locker. The exception would be something like a high-traction slick-rock climb with wheels high in the air. One irritation is that the locker can only be engaged when halted, and only in low range. Would have been better to have had it engaged anywhere, any time….never know when you’ll need it! And as usual with lockers it won’t come straight in or go straight out, needs a bit of turning and driving before it locks up. Tight turning circle allowed a straddle then move to the right for the final little rock ledge. The factory towbar hangs too low and should not be fitted for offroading. We expect there will be aftermarket replacements out soon, and refer notes below about touring. Towing: We did not tow with the Pajero Sport, but let’s have a look at the numbers. There’s the usual 750kg unbraked tow capacity, and 3100kg braked with a full 310kg towball mass capacity. The gross vehicle mass (GVM) is 2710kg, and tare around 2050 depending on spec level, so payload is only 660kg or so, not a great deal…imagine if it was a 7 seater. Front and rear axle loads are 1260 and 1600kg respectively. The headline figure of 3100kg is better than Pajero, Fortuner and Prado. However, GCM is only 5400kg, and the total of 3100 (max braked) + 2710 (GVM) = 5810, well abovethe 5400kg GCM…so clearly you can’t tow a 3100kg trailer with anything like a full load in the Sport. In fact, 5400 – 3100 = 2300kg which is the most the Sport can weigh if it is to tow a 3100kg trailer, otherwise GCM will be exceeded. And 2300-2050 = 250kg of payload but pretty well par for the course with 4WD wagons, the tow figure is usually just a misleading (marketing) headline that won’t work in practice. Another example is the HAVAL H9 which has a 2500kg tow figure but only 100kg TBM. The Sport does have electronic Trailer Sway Control, an important safety feature which not all other wagons offer, and with eight gears the 133kW of power would seem like more – we towed a 2500kg trailer with a 5-speed Triton, and that did pretty well so we’d expect the Sport to do even better. Finally, the Sport has all-wheel-drive (in 4H mode), much better than 2WD for towing. And a tight turning circle is always a bonus when trying to reverse a trailer under spousal direction. So, to summarise this bit on towing. The Sport is, on paper at least, a better bet than most of its peers; it has a high tow rating for its class, trailer stability control as standard, all-wheel-drive, eight speeds, and a towball mass to match its braked tow rating. Confused about towing? Learn everything you need to know about towing trailers. 4WD touring: The Pajero Sport certainly has the offroad capability to tour Australia, and Mitsubishi offer a cargo barrier so you can keep your gear out of the passenger seats. The spare is at least a full-sized alloy, otherwise I’d have to rate the Sport 5%, and the difficulty of releasing it when loaded has been noted above. The big problem is the 68L fuel tank. That’s far too small – contrast Fortuner with 80L or Pajero with 88L for example, let alone Prado with 150L. If we assume 60L is usuable, then working off a 35% increase (assuming heavy load and the usual touring mods) on the combined cycle to 10.8L/100km then we have a range of around 560km, not very much even if the Sport is at the more frugal end of the thirst range of its class at 8L/100km. The solution to all those problems would be a spare wheel carrier with a built-in towbar, and then add a long-range tank. We don’t know if such a solution is available (tell us if you make one) but it should be. The final change would be ditching the 18″ rims for a nice set of 17s, and we suspect they fit but haven’t confirmed. Yes, there are now 18″ all-terrain pattern, light-truck construction tyres but 17s are cheaper and offer valuable additional sidewall. I honestly don’t know why Mitsubishi specified with 18s on a vehicle of this nature, this vehicle is not a car that is going to appeal to people who like rubber bands on their wheels. Looks fine now, but you wait till it has a full load, aired down to 20psi and balanced on diagonal wheels. Then that sidewall will look a bit ordinary. Let’s have 17s on this please! The second row seats appear to be easily removeable (we didn’t actually try) so those touring two-up can enjoy a decently large and flat storage area…or just remove either the 40 or 60 split. There is a bit of space in the engine bay for the likes of a small compressor, and possibly with some work a smallish second battery. Here’s the tool you use to unlock the electric parkbrake if it is stuck on. Instructions in the owner’s manual. Overall, the Sport can definitely work as a touring wagon, but note the limitations with child seats earlier, and for some people the small tank won’t be an issue. If you accidentally drive forwards when there’s something in the way the car detects the problem (hopefully) and stops. Yes, accidents have happened this way. Mitsubishi claim it will stop the car completely from around 30-40km/h if it detects an impending collision, subject to traction and detecting the problem early enough. Oddly, there appears is no active cruise control, just the standard cruise function. We did not test the FCM system. There are three selectable distances for FCM. This image shows the system set to the longest distance. Now quite common, this system illuminates a warning symbol in the wingmirror if it detects a car in your blind spot. There’s three grades of Pajero Sport. All are 8-speed automatics with the 133kW diesel engine, and the Super Select 4WD system. This is because Mitsubishi would be likely to sell about two manual Sports and one petrol. Metallic/pearlescent paint is an extra $550. The base model is always a good place to start these days as they tend to have all the basics and then some – Pajero Sport is no exception. Offroaders will be tempted into the GLS by the rear differential lock, but to be honest the traction control on the Sport is so good you would rarely need it, and for most tourers the $3500 could be better spent on wheels, snorkels and the like. Other than that, the GLS doesn’t hold a lot of attraction. The electric seats aren’t wonderful enough to be a must have, you don’t get any useful extra adjustment over manuals. The tempting kit is in the Exceed where you get the very useful camera system, and the safety aids of blind spot warning, UMS and FCM, heated seats (note: must get a long-term test car with heated seats over winter) and a decent sound system. Mitsubishi haven’t gone and charged another third of the base model’s price for the top trim level (ah, Fortuner), so the Exceed does start to look attractive and remains good value. Check back soon – we will also publish brief comparisons of Fortuner vs Pajero Sport, and Pajero Sport vs Pajero. I was very pleased to be asked to drive the new Pajero Sport and it was an instant response – yes of course, when do we go? I must confess up front that I own a Pajero, albeit a much modified older version, and have an affinity with the make. Always prepared to speak my mind, I approached this car with as clear vision as possible as a spade is a spade after all! The advertisements for the Pajero Sport imply that it is the ideal family sports car. We shall put that claim to the test. The initial bitumen section showed promise of things to come. Settling into the plush leather seats the car felt warmly familiar and it was very easy to roll over the speed limit while just getting used to it and leaning into every corner. The handling is very neutral and confident. There is sufficient power and a gear for all occasions with the 8 speed transmission. Shift points have been extremely well calibrated to keep the engine on power whenever needed. There is minimal engine and road noise, just enough to keep you in tune with what is happening. Next we turned onto well-formed gravel roads which negotiate their way around the perimeter of the park. This is time to see how much of my rally experience was still available. Plenty was the answer. This car can be driven hard on the dirt with great confidence. The shock absorber and spring rates are well balanced for the job. Turn off the stability control and four wheel drifts are the order of the day. Brake bias was excellent with just enough rear brake enabling the tail to slide out when pushed hard into and through the corners. Jump on the loud pedal and the four wheel drive pulls you nicely out of the corner and you are looking for the next… and the next…. and the next! How good is this!! No Rob, you can’t have a drive yet! Well so far we have a terrific car for the smooth and slightly rough stuff, how about serious 4WD territory. After all this is what the Pajero brand is renowned for. First to an unnamed track with deep rutting over a washaway and the first reasonably steep climbs. We negotiated the downhill with the usual amount of “wheel in the air” poses but the car felt comfortable and in control. We turned around and headed back up which was an entirely different obstacle, gravity is no longer your friend. When we drove the Haval H9 on this track we were unable to pass this point when ascending. We approached the ruts head on to test the car at the worst possible condition. First section cleared, but not over the top, too much wheelspin so we tried with different settings on the traction control. The setting for rock made the system react much quicker than the gravel setting. This had been great for open quick tracks but rock was definitely the best for slow crawling over various surfaces. Unfortunately, the holes were too large and caused too much cross axle flexing for us to negotiate any further. Back down and try a different route. As with approaching any obstacle, a well planned approach gives the best results and so we straddled the first hole, steered a little left and drove straight over with no difficulty. Continue uphill, turn around and pose for the photographer! Further along this unnamed track there was a short sharp climb which the Sport handled with ease. Next was a track with deep ruts with plenty of mud and water. Here the ruts have been deepened by vehicles with high clearance and large diameter tyres which meant that we would certainly find the clearance limits of the Pajero. A small amount of grading with the underbody and we were through. No doubt potential owners would fit bigger tyres and so that this wouldn’t be an issue. Despite the standard settings we didn’t encounter any clearance problems throughout the whole day. The real challenge on the track was next with a rock face side angle of around 30°. The bottom of the slope can be straddled, but we chose to drive on the slope and found the car to be very sure footed. Around the next corner we have a steep off camber loose scrabbly climb which again showed the prowess we were really enjoying. Several rock ledges were then negotiated with ease. Four wheel drive credibility well and truly established! The traction control proved time and again to be superior to the rear axle diff lock when driving on loose surfaces. A quick blast along a dirt road had us back in rally mode then a tour along some bitumen sections without having to stop for too many more photos was pure driving pleasure. To prove that I’m not totally biased in this report, I do have a few gripes. What were they thinking when the tow bar was designed? It looks a total last minute add on and clearly not part of the original design brief. Why do we let manufacturers of all kinds deliver us drab cars? Black, white, silver and grey aren’t real colours! How about something attractive for a change? Give me a loud blue or red any day. And while I’m on my soapbox, black interiors have to be the most impractical of all. By the time Rob has been in various positions to take the speccy shots you see in this report, he brings a shed load of dust and gravel back into the car and it looks pretty ordinary very quickly. In summary, this IS a great “family sports car”. It is equally at home on any road condition and has the true Pajero off road ability that generations of the model have demonstrated before. Any one who buys this car will not be disappointed.